If you look online at the nappy retailer sites it may seem a bit pricy to pay say £15 for one nappy. It is true that the initial outlay for a set of cloth nappies is more expensive than a pack of disposables – you could buy a big pack of sposies for £15. But the difference is that that £15 will in effect and up in the bin – once the nappies are used once, that’s it. But cloth nappies can of course be used again and again, on several children, so that £15 stretches over a long period of time. We had a set of fitted nappies that had been used on 2 children before mine, then my 2 boys, then I passed them on to another mum for her new baby when Andrew potty trained, so that’s at least 5 children, and they are still going strong. Some nappies do cost £15 to buy, but not all have to cost that much. First of all there is the thriving pre-loved market, where you can find cheaper than new nappies in good condition – Facebook has several groups for buying, selling and trading nappies, eBay has lots of listings and you can get some real bidding bargains, and there are specialist nappy forums like Cloth Nappy Tree that have free-to-list classifieds sections. So if you don’t have the cash for the initial outlay by buying new, these are a great place to look, and if you do have the cash to buy brand new, you can usually get a fair bit of your money back once your kid(s) have finished with the nappies by selling them on via these sites, knowing that they will be going to another family rather than landfill. There are certain types of nappy that aren’t so popular, and these can be found really cheap or even free on freecycle (for example). These tend to be flat nappies or pre-folds, and also some older brands of fitted nappy like Motherease and One-life. I’ve personally always got on very well with both of these for my boys, even though they aren’t the most popular, so it’s not like they are no good, just not the prettiest, but teamed with a funky wrap they work well. One thing I would recommend before buying any whole sets of nappies that are more expensive than a real bargain, is trying a few different ones, either through your local nappy library or by buying a few cheap ones pre-loved. If you don’t get on with a particular style, at least you won’t have shelled out a couple of hundred pounds on a whole set of that style! Modern cloth nappies are nothing like the image that you might have of needing to be an origami master to get a square piece of towelling onto a baby’s bottom. There are so many different styles, and many are just like a disposable in terms of how you put it on the baby – an all in one piece with absorbency and waterproofing sewn together, and with velcro tabs that pull across the tummy to fasten, it really couldn’t be any easier. Some are slightly more complicated in that you have to popper or stuff the absorbency into the waterproof shell prior to use, but once it’s in, you just put it on like a disposable, and once you know what you’re doing, you can stuff nappies with a blindfold on. Poppers are an alternative to velcro, and especially handy if you have an older baby or toddler who likes to pull off nappies (including disposables) as poppers make it harder for them to do that! It might seem a bit odd to be carrying around dirty nappies in your change bag, when you can just throw a disposable away where you changed your baby. If the nappy is just wet, you can easily pop it into a ‘wet bag’ – waterproof zipped or drawstring bags that are designed to hold nappies until you get home. If the nappy is dirty, then I just make sure that as much of the poo as possible is flushed down the toilet, and then pop it in the wet bag and sort it out properly when I get home. I make these bags myself, and I know that with a good zip closure and sealed seams these really do keep in smells, so there’s no need to worry about stinking out your bag. Or if space in your bag is an issue, then most wet bags for out and about (like mine 😉 ) come with a popper-fastening handle that can be fastened onto something else like a buggy handle or bar. Or if you’d rather not carry cloth nappies around with you, there’s no reason why you can’t just use them at home. I think the first point to make here is that any amount of landfill that is spared by using cloth nappies is great – whether that’s one nappy, 10 nappies, 100 nappies or 1000 nappies. So even if you do end up switching back to disposables, it will not have been a waste (in fact quite the opposite!) 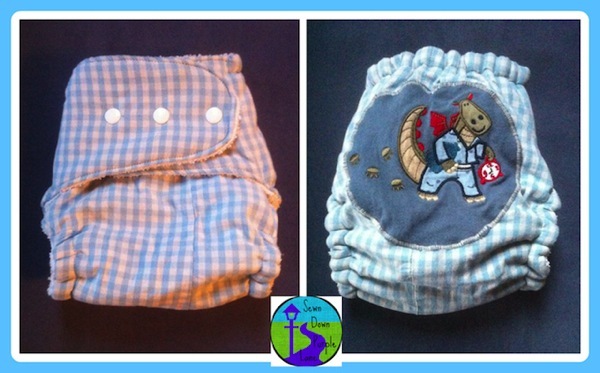 to have used cloth nappies for a shorter period than the average 2.5 years from birth to potty. The second point is that you may be surprised by your childcare provider’s policy on nappies. Our childminder was perfectly happy to change cloth nappies (after all, she’d used terry squares with her own older children), and I know a few other childminders who use still cloth nappies on their own children so are happy to do it for others in their care too. I have less personal experience of nurseries, but I know a few friends who send their child to a nursery where the staff are also happy to change cloth nappies. I’m not saying that every childcare provider will be OK with it, but of the people I know who use cloth nappies and whose child also goes to a nursery/childminder, most have managed to continue using cloth nappies once they returned to work. To tie up this post on myths, here’s one that I’ve touched on a few times above. Although it’s nice to use any cloth nappies that you buy as much as possible, it really doesn’t have to be full time. If you only use them at home, that’s OK. If you only use them until you go back to work, that’s fine. If you don’t start using them until your baby is a few months old, that’s great. If you only use them in the daytime, that’s not a problem. If you get behind on the washing and there aren’t enough dry, don’t worry. If you just have a bad day and can’t face another cloth nappy, nobody will think anything less of you! As I said above, if you just save one or two disposable nappies from landfill, that’s a help, and as the saying goes, every little helps. We started using cloth nappies when Andrew was about 6 weeks old, once we’d got through all the disposables we’d got free and been bought, and once we felt stressful feeding issues has settled down to some extent. Joel was in cloth nappies from a few days old. Andrew was in disposables at night until he started soaking through them at about 18 months old and I had to do some research on night nappies that were absorbent enough for his super heavy wetting. Joel has always been in cloth nappies at night. Sometimes we use disposables – when we go away (about 3 weeks a year) is the main reason, or when Joel got a particularly sore bottom from teething wee (until I found out about charcoal boosters and these have been great for this), or if Andrew’s night nappies haven’t quite got dry in time depending on when I did the washing and whether I could get it outside. So even as someone who likes to promote cloth nappies, I’m not afraid to say that we occasionally use disposables, it’s by no means all or nothing. There’s also the eco-friendly disposable option, or cloth nappies that you can buy eco disposable inserts for that fit like a cloth insert into the cloth shell – another reason why it’s not black and white. I hope that this series of myth busting posts has been useful for you. Please let me know if you have any further questions, I’m happy to chat nappies any time. There is still some time to join in all the fun of Reusable Nappy Week and try to win some nappy prizes. 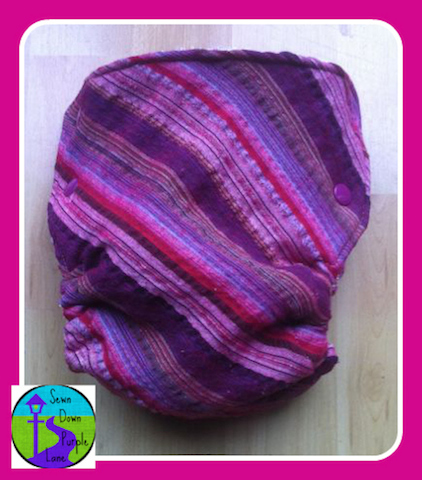 Check out the Reusable Nappy Association’s Facebook page. Happy nappying! 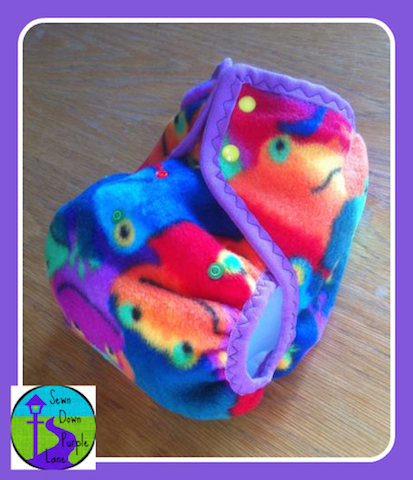 Welcome back for another instalment of cloth nappy myth busting for Reusable Nappy Week. If you missed my last post, which was all about laundry, you can find it here. Today I’m concentrating on what modern cloth nappies look like and how comfortable they are for babies and toddlers to wear. So, like last time, here are some statements that I think are myths…. 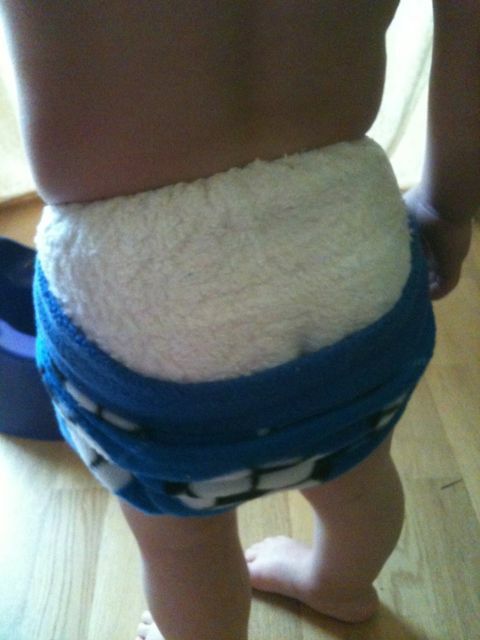 Cloth nappies have come on a loooong way since the days of terry squares and plastic pants. Even since we started out with cloth nappies over 3 years ago there have been new designs coming onto the market giving even more choice. 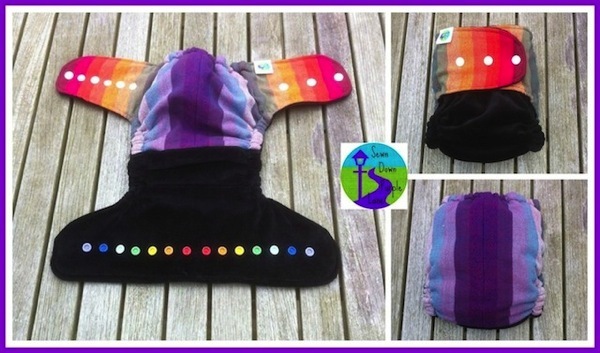 The photos I’ve included in this post are testament to the fact that cloth nappies come in a rainbow of colours and patterns. All the big brands as well as independent work at home mums offer funky and pretty prints as well as bright colours, many different designs to suit various tastes. 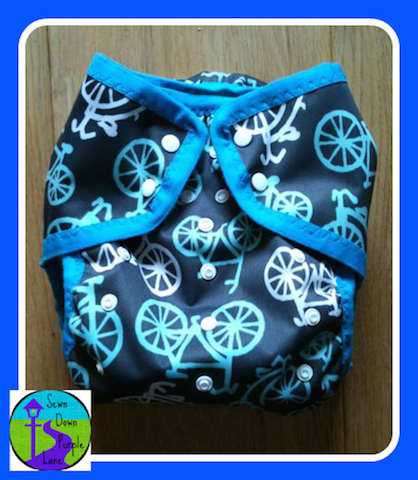 Even if you stick with terry squares/pre-folds/or fitted nappies, there are some lovely wraps out there that can jazz up even the oldest of functional nappies underneath. In fact our staple nappies for Joel are ‘boring’ pre-folds with various wraps, most of which I have made from fabrics that are bright, funky and suit him. In some ways though, when I first started using cloth nappies on Andrew, I didn’t mind what they looked like because they were always under his babygro or trousers anyway. But once it got to summer, it was lovely to let him run around at home or in the garden with just a nappy and a t-shirt on, so we could all see the cute nappy. It’s easier to include the nappy as part of a cute outfit for girls, because a lovely little pinafore dress is what you might dress her in anyway, and whatever kind of nappy she’s wearing inevitably gets flashed when she bends over when playing. Fairly recently I came across baby leg warmers and bought some for Joel to try. 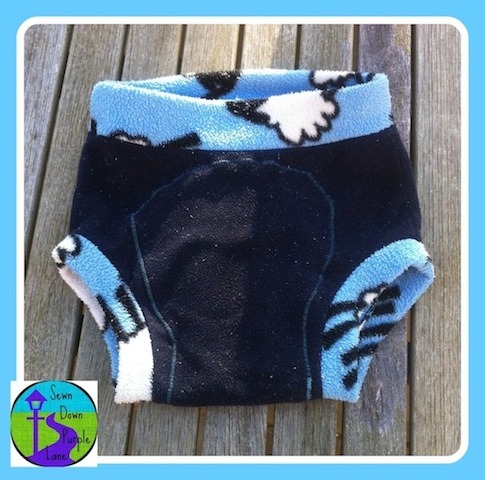 These are a great way to see a lovely cloth nappy on a boy, and they are very practical too – no faffing to get trousers back on after a wriggly nappy change, and they’re easy for him to move about in, especially when he was crawling and learning to walk. One of the great things about the variety of modern cloth nappies is that there are all sorts of shapes, sizes, styles and fabrics that suit different children. Some nappies are bulkier and some are trimmer. Bulkier ones may also be more absorbent than trimmer styles or have other attributes. All in one nappies tend to be less bulky than a fitted nappy plus wrap, and pocket nappies are as bulky as the amount of inserts that you stuff into them. So my first point here is that not all cloth nappies are bulky. But even with the bulkier styles, I don’t believe they are ‘too’ bulky. Some parents worry that cloth nappies are too bulky and so put their baby’s legs in a funny position. Quite on the contrary – cloth nappies are actually better for hip development because they support the legs in a better position – babies legs are supposed to be ‘froggy’, it’s not a bad thing, they’re not supposed to look like straight adult legs for quite a few years (this also applies to optimum baby wearing positions). 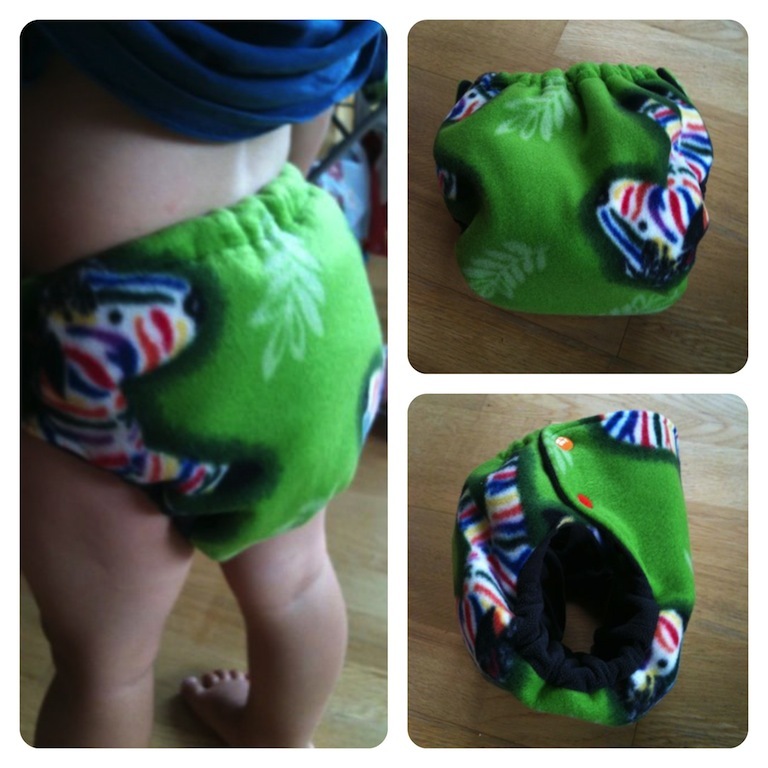 Another worry is that the nappies are so bulky that they make the baby slow to crawl/walk. As far as I know there is no national-scale evidence for this, and my own boys both walked before they were 1 year old, one crawled from 6 months, the other 9 months, so I know that cloth nappies didn’t hinder them in their movement. And when they did pull themselves up to standing and take their first steps, having a nice, soft, fluffy (some may call it bulky) bottom to fall back down on was much more appealing than a thin disposable nappy. Following on from the bulkiness, I’ve heard it said that cloth nappies are uncomfortable. Now I’ve never actually asked a baby and got a comprehensible answer as to whether they are uncomfortable, but I guess if my boys had been really uncomfy in their nappies they would have screamed and screamed until I did something about it. I think it is possible to get a bad fit with certain styles of nappy, which may lead to discomfort, but this can be easily fixed by asking someone with a bit more experience. This is where finding a local nappy meet with other parents whose children wear them is great, or even asking in one of the many cloth nappy sales and advice groups on Facebook. A key area where many people slip up is putting nappies too far down the thigh – tucking it into the knicker line is best, to avoid any rubbing on the thigh. With some styles of nappy this isn’t an issue anyway. As babies come in various shapes and sizes, different nappies suit different babies. For example, babies with very chubby thighs would probably find nappies with popper fastenings at the side more comfortable than nappies that fasten at the front. Short babies would probably find nappies with a low rise more comfortable than those with a high rise. It’s just a case of finding what works best for your baby, and a good way of doing this is borrowing various kinds from a nappy library, or buying a few different styles cheaply second hand, until you find the best ones and buy more of those. Many nappies are adjustable in size, both in width (like a disposable, where you do up the wings) and in height (unlike a disposable), so you can adjust to get a good fit as your baby grows and changes shape. Some clothes brands aren’t cut very generously around the bottom area, so cloth nappies appear ‘too bulky’ for the clothes, but we generally haven’t found this to be a big issue and most of the boys’ clothes have fitted perfectly fine over their nappies, even if we needed to go up a size a bit sooner than we would if they were wearing disposables. The great thing about cloth nappies is that you decide what goes next to your baby’s skin. Disposables are full of chemicals, and I personally prefer to have cloth nappy fabrics (which don’t have chemicals) next to my boys’ skin as much as possible. Some babies are actually highly sensitive to the chemicals in disposable nappies and come out in a rash when they are in disposables (this hasn’t happened to my boys, but I know of other children who have had this issue). If you do come across rash in cloth nappies, there are some things you can check for. It’s important to not have the skin wet for prolonged periods of time, so changing cloth nappies every 3-4 hours at most is a good idea (though I have sometimes left Joel for longer as he’s a lighter wetter than Andrew was in nappies), and having a ‘stay-dry’ fabric such as fleece, minky or suedecloth next to the skin helps to wick the moisture away from the skin into the absorbent fabric of the nappy. Apart from prolonged exposure to moisture, nappy rash is also caused by irritants next to the skin (for example the ammonia build up that I mentioned above in our case) – this could be a sensitivity to a particular detergent, which some babies in disposables show with respect to their washed clothing, or to a particular fabric, for example some babies are sensitive to synthetic fibres so are best with natural ones such as cotton. Or it could be down to a change in diet, a food sensitivity or even teething. That’s it on myth busting for today. I’ll be back with one more of these posts at the end of Reusable Nappy Week. Hope they are proving useful, and hope you’ll join me for the final instalment. 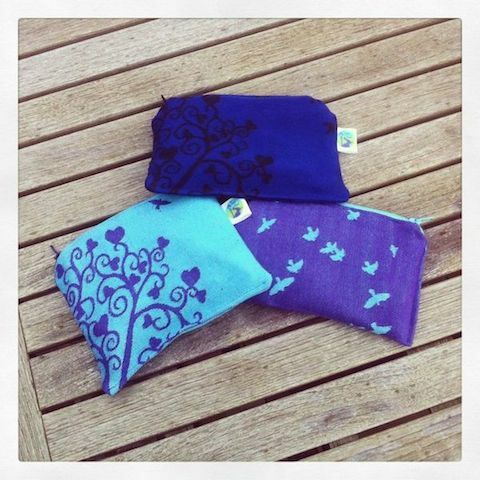 It’s that time of year again – Reusable Nappy Week! Well it used to be called Real Nappy Week, though I’ve always preferred to call it Cloth Nappy Week (as I don’t like the implication that disposables aren’t ‘real’), but Reusable means the acronym RNW still fits. 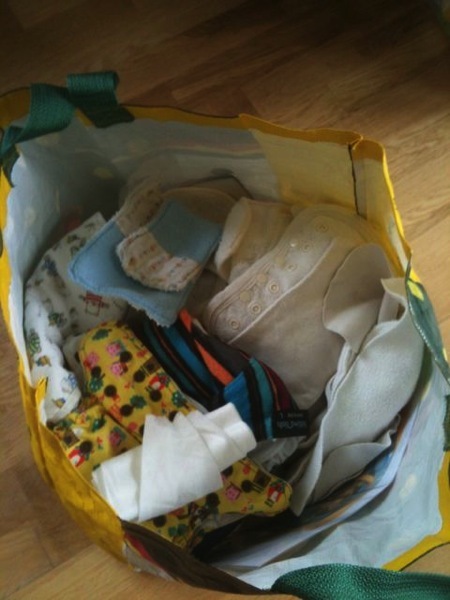 I’ve blogged about cloth nappies quite a bit over the 3 years since we started using them, especially when I was running Nappyness (Cambridge Nappy Library and Meet-ups). 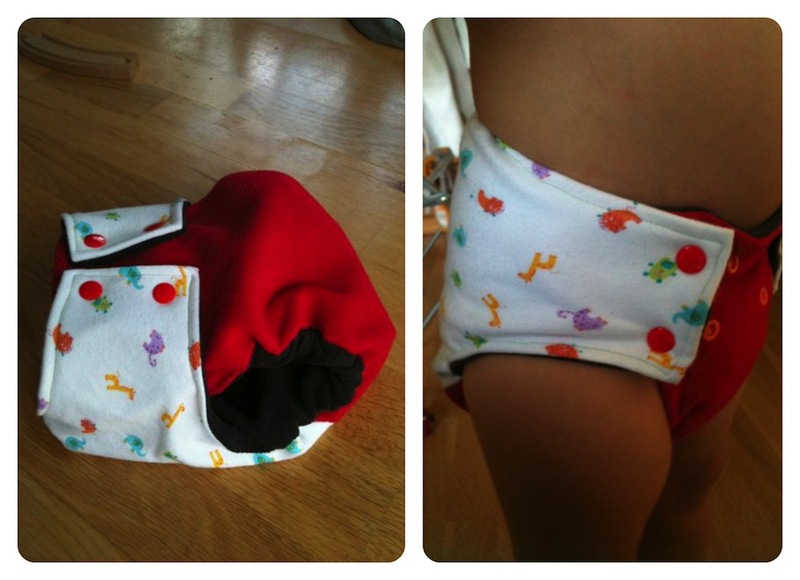 This year I decided that a couple of posts about busting some cloth nappy myths would be a good idea. I know I had some preconceptions about what they were like before I looked into it some more — mainly from what I’d heard they were like when I was in nappies! And others who I’ve spoken to have had similar ideas about what they think cloth nappying involves. So here are some statements about cloth nappies that I have personally come across — of course there are no doubt more — and why, in my experience I think they are myths…. Forget boil washing on massively long cycles! That’s the first thing to note when washing modern cloth nappies. In fact if you boil them, they won’t survive too long. Boil washing would be fine if you were using plain cotton terry squares, but not for newer designs that have PUL (polyurethane laminate — waterproof fabric) and/or elastic as part of the nappy itself, because these materials degrade quicker than you’d like at high temperatures. But there’s no need to wash at those high temperatures anyway. 40 degrees is generally fine for most of the times that you wash cloth nappies. The main exception when it’s advisable to wash at 60 degrees is if you know of or suspect a tummy bug or other contagious illness. Otherwise I wash at 60 about once a month or so or if I do a ‘strip wash’ (more on this soon). Washing at 40 rather than 60 (or 90) also reduces the amount of energy you use to clean the nappies. One issue that cloth nappy users sometimes run into if they don’t know about it (like I didn’t when we first started before I read up online about it) is using the right amount of detergent. Too much and it can clog the fabric making it less absorbent, too little and it won’t be effective in cleaning and may lead to ammonia build up. Other factors like water hardness and washing machine can also influence how much detergent is needed. For example we lived in Cambridge for 3 years of nappy washing and after realising that we were using way too much detergent leading to less absorbent nappies, I cut right down to the often cited 2 tablespoons of powder; only then we had ammonia build up (stinky nappies, sore bottoms), so I used a little more (about 4 tbsp, still less than a full dose) and we no longer had issues. Some modern washing machines are very ‘eco friendly’ in their minimal water usage, but this isn’t ideal for nappies that need plenty of water to rinse the detergent away so it doesn’t hang around in the fabric. OK, this does sound complicated, you may be saying. It sounds like it, but once you do a bit of trial and error to figure out how much detergent if optimum in your machine, it’s very easy. And if you do use too much detergent for too many washes or if you get ammonia build up, it’s a simple procedure to correct: you do a ‘strip wash’. As the name suggests this means stripping the nappies of any built-up chemicals. If you goggle ‘strip wash nappies/diapers’, a few different methods come up. The one I’ve done is to use a full dose of detergent at 60 degrees and then do many rinses until I can no longer see bubbles in the washing machine. Have you already got lots of washing, with a baby and maybe other children too? I know not everyone wants to have any extra loads of washing than they have to, but my take on this was that I’m doing piles of washing anyway, so what’s a few more loads a week going to do to me? I had two boys in full time cloth nappies for about 9 months until Andrew potty trained in the day (he still wears nappies at night), and I did (and still do) 6-7 loads of washing a week – total for clothes, bedding, nappies etc. What about fabric softener? Some people worry about fabrics (that are next to sensitive baby skin) getting rough over time, and so would like to use softener to counteract this. The trouble is that softener clogs the fabric and leads to a decrease in absorbency. I’ve not had a problem with rough nappies, and there are several styles that don’t have rough terry fabrics next to the skin anyway, but rather a soft, stay-dry fabric like fleece, minky or velour. I’ve also heard that a quick blast in the tumble drier every now and then can help to soften up rough, dry nappies. Which type of detergent is best? Non-bio is better than bio, because bio will degrade elastics and PUL over time. Powdered detergent is better than liquid, because liquid tends to coat fabrics leading to build up and decrease in absorbency. Some cloth nappy users swear by natural products like the Eco Egg for washing nappies, which have no chemicals so you can’t get a build up of them in the fabric. We tried an Eco Egg a while ago but didn’t think it cleaned particularly effectively in our machine. This is just our experience and I’ve heard that its performance can differ quite a bit depending on your machine. I think this very much depends on the time of year and what your home is like for size and ventilation. 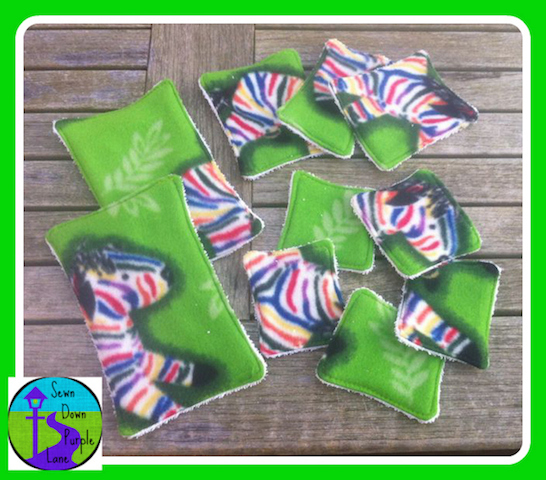 Of course it’’s easiest to dry nappies when you can get them out in the sun and wind and they dry naturally. The sun also helps to get rid of stains. I’d say I get nappies outside most days that I wash them from about April to September, though I’m aware that some fairly recent British summers have been very wet and this might not always be possible. I think we were lucky that our flat where we lived for 3 years of nappying was very efficient at drying nappies hung on an airer — they would generally dry in a day, or two days for the very absorbent night nappies. It was only a small flat, but we never felt like nappies and washing were taking too much room, so I’d say it’s perfectly possible to get nappies for 2 dried in a flat without a tumble dryer. Since we moved to live in a (fairly modern) house, it’s been taking a bit longer for them to dry inside. I’ve found that the key is to have good air circulation and ventilation in the room where they are drying. Another key point is to think about what style of nappies dry quickest (and that are suitable for your baby’s/toddler’s needs). I find that it’s useful to have a variety of nappies, some that dry quicker and others that dry slower, so we can mix and match depending on what’s dry. Flat nappies like pre-folds dry very quickly, as do the waterproof wraps that go over the top, and some styles of nappy have insert sets that popper into the shell, meaning that you can have extra popper-in sets (which dry slower than the shell) to use with the quick-drying shell. Natural fabrics take longer to dry than man-made fabrics, so having some of each means you’ll always have some nappies dry and ready to use again sooner than others. And just having more nappies available in your wash and wear cycle in the winter than in the summer is a good idea. What about tumble drying? Well it is possible to tumble dry some types of nappy, but if you regularly tumble dry, the energy you use to do it means that using cloth nappies is no longer as environmentally friendly as you might think. Of course not everyone uses cloth nappies for environmental reasons, but if that’s one of your reasons, tumble drying is best avoided. It’s also not a good idea to regularly tumble dry nappies with elastic or PUL (waterproof fabric) because they degrade more quickly with constant heating like this, and some fabrics, especially bamboo, are quite fragile and tumble drying would decrease the life of the nappy. What about drying on radiators? Similar points apply as to tumble drying. Direct heat like this is not good for elastic, PUL or fragile fibres like bamboo. From an energy consumption point of view – if you constantly have fabric items hung over your radiators, the central heating will have to work harder to heat your room to your desired temperature, and you’ll be using more energy for that. So again, it’s not ideal if you’re concerned about the environmental side of nappies. You get poo on your hands when changing nappies — full stop! So I guess this one’s not actually a myth, but I don’t believe it’s true that you get more poo on your hands using cloth nappies than disposables. This kind of statement is usually flung at me by those who don’t yet have (born) children. Unless you’ve been a particularly well involved Aunt/Uncle/much older sibling/Godparent etc. and actually changed a baby’s nappy, then you may not be aware that being a parent means you’re going to come into contact with poo — fact. Of course there are steps you can take to minimise the amount of poo contact, by learning how to change a nappy most effectively, but it will still happen. And that’s before you even get to toilet training. When it comes to cloth nappies, there are flushable liners that you can place in the nappy to catch any solids in the nappy, which you simply pick up and flush, meaning there is no more contact than sorting out a disposable nappy. This is probably also a good time to point out that technically we’re not supposed to get rid of any human poo in the bin, so even disposable users should flush as much poo as possible from the nappy — believe me, I’ve tried, and it’s a heck of a lot easier to flush poo from a cloth nappy than a disposable. Of course nobody actually does this and it’s clearly not an enforced rule, but still, interesting if you’re concerned about the environmental side of nappies. I personally choose to use reusable fleece liners, which I pick up at a corner that isn’t covered in poo and sluice in the flush as I pull the lever on the toilet, holding on tight to the liner. I may get some dirty water splashing over my hands, but it’s no more yucky than muddy puddle water, which I frequently come into contact with when looking after my boys, and in the bathroom I can immediately wash my hands with anti bacterial hand wash (which I can’t in a muddy field). I hope this has covered enough about poo… or maybe not quite….! One image I had of cloth nappies before we used them is buckets full of pooey water hanging about in the bathroom until wash day. In fact I did this for a while until I learned that this isn’t how best to do it for modern cloth nappies (i was going on perfectly reasonable practice from old terry squares). These days the advice is to ‘dry pail’ instead of ‘wet pail’. When you take a wet nappy off your child, you simply put it in an empty bucket with lid or a ‘wet bag’ (waterproof bag that keeps in smells) as it is – no water involved. When you take off a dirty nappy, you get rid of any solid poo by using a flushable liner or by sluicing a reusable liner in the flush, and then put the nappy in the bucket/bag as it is. When it comes to wash day, you do a cold rinse cycle before your main wash, which is the equivalent of the old soaking, except this means the nappies aren’t sitting around in the stinky water for a couple of days. It’s important to do a cold rinse, because if the water is body temperature or above, stains will be set in rather than washed out. 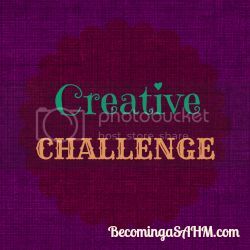 A while ago I saw that Caroline over at Becoming a SAHM was starting a new linky called ‘Creative Challenge’. The idea is to post about any creative activity that you’ve been up to that you are trying to do better or more often or challenge yourself in some other way with it. When I saw this it was around the time that I was just setting up Sewn Down Purple Lane, and I thought this was particularly fitting for the Creative Challenge linky theme, because although I’ve been creative with my sewing for a while, I was now stepping up a notch and challenging myself to selling my creative wares. I’ve been meaning to write about this and join in with the linky with this post for a while, but as long as I have my sewing machine with me, the default is to sew rather than write about sewing, so it took until coming on holiday with no sewing machine to write this. First I thought I’d write a bit about my background in being creative, before moving on to how I’m finding the new challenge now that it’s well underway. I’ve enjoyed sewing (as well as other crafts) for as long as I can remember. I took Textiles as a GCSE subject, which was some lovely creative relief from the more academic subjects. As a teenager I made some of my own clothes and bags, but as university and young adult life took over, I didn’t sew as much – though I did a lot of cross-stitch as a stress reliever during exam periods. Just before Andrew – now 3 years old — was born, I got my machine back out and altered a pair of curtains with some Very Hungry Caterpillar fabric to make them long enough for his room-to-be; this gave me a taste for sewing again! I also got into using cloth nappies on Andrew. When I was pregnant again and realised we would have a 21-month age gap and therefore two little ones in nappies, I bought some more to expand our nappy stash. 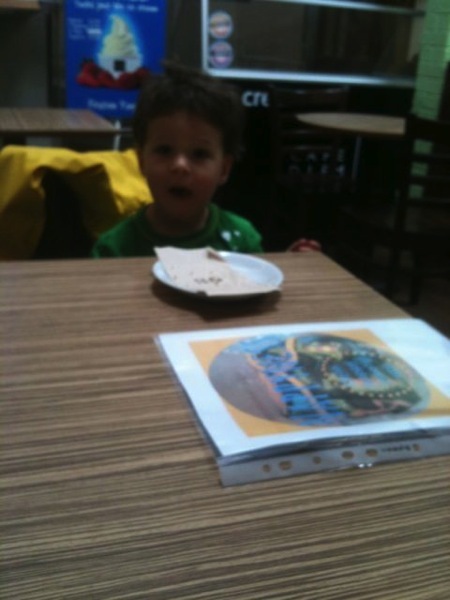 The trouble was though, Andrew at nearly 2 years old was getting very big for standard ‘birth-to-potty’ nappies, especially his night nappies that needed to be boosted for heavy wetting. So I set to and sewed him some huge toddler nappies and fleece covers using fabrics upcycled from clothes and flat terry nappies. That’s where my upcycling journey really began. 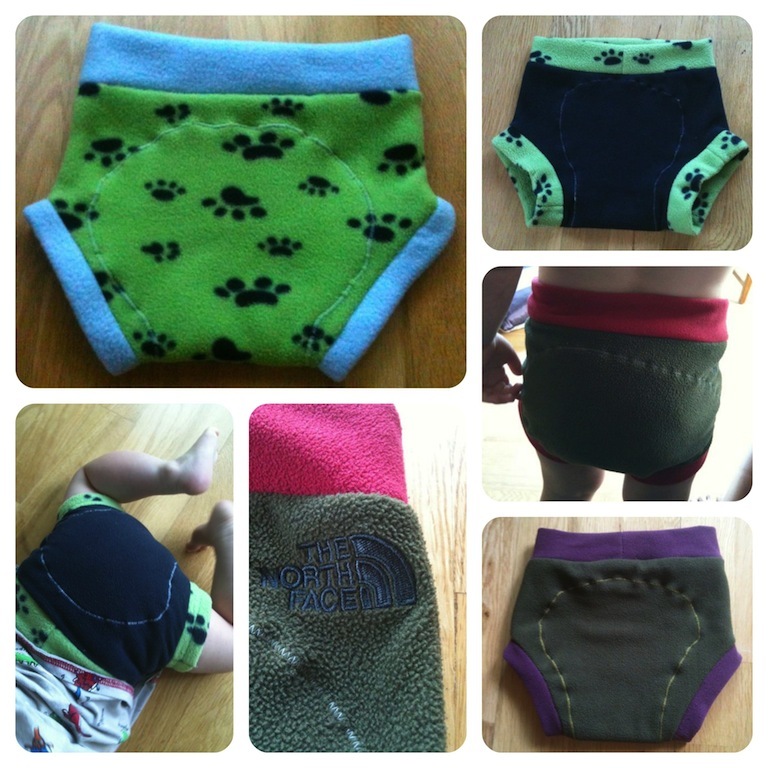 I tried various designs and types of nappy, making my own patterns as I went along. Now the majority of nappies and waterproof wraps that we use are mummy-made, mostly from fabric that used to be something else wearable, and I’ve sold many of our mass-produced cloth nappies. After I started making nappies, the need arose to do something about the dribble situation with Joel – now 17 months old – who wet through bibs spectacularly faster than Andrew ever did. The trouble was that the standard dribble bibs that we had been bought had just one layer of absorbent fabric. That’s when I thought to use fabrics with nappy absorbency levels in a bib, again upcycling from clothes and flat nappies that were no longer useful to us. I sewed some bibs with a funky front fabric (from patterned cotton clothes), a stay-dry backing fabric (fleece or synthetic knitted) next to his skin and other clothes, and a hidden layer of terry cotton for ultimate absorbency. I’m pleased to say that these super absorbent dribble bibs have been fantastic at keeping his chin and top dry despite his dribbling skills that rival those of a top footballer. I also like the bandana style — it looks more stylish than a classic round baby bib, and it flaps around less so doesn’t get in the way especially when he was in the crawling stage. 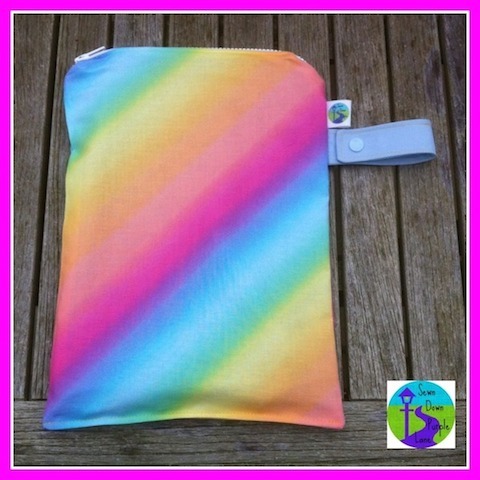 My latest fascination is sewing with the gorgeous woven fabrics that are used as baby/toddler slings – one long piece of fabric is wrapped around parent and child in a secure position – hence the name ‘wrap’. 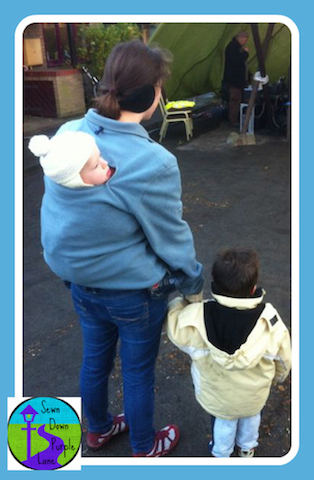 I got into babywearing in this way when Joel was born. It’s quite easy to come by so-called ‘wrap scraps’, smaller pieces of wrap that are left over when weavers make the wraps, or when one is chopped up and converted into a sling with buckles, or if one is damaged somehow. There are so many possibilities for upcycling this lovely fabric – so far I have made waterproof bags, purses, bibs, glove clips, nappies and (probably my favourite for the name) ‘wrap scrap nappy wraps’! Well done if you’ve followed all the wraps here. I’ve also figured out how to convert some of our adult clothes that are broken in part or too small into clothes for the boys – for example leggings from jumpers, small trousers from bigger trousers, slippers from jeans and a shirt, and a coat for babywearing that fits over both Joel and me when I’m carrying him on my back in the sling. I never throw any kind of fabric item away, even Daddy has learnt to give me his old stained shirts and worn through the knees trousers – there’s always something new I can make with them. Having done all sorts of sewing for my boys, I eventually decided to set up shop. I say ‘eventually’ because I’d been thinking about it for a while but waited for a good time to do it. With our relocation to a new city, and the boys being at an age where it’s manageable to work around their routines, it seemed the right time. So I started sewing items to have in stock (mainly bibs, clothes and nappy accessories like waterproof bags and washable wipes), set up a Facebook page and Etsy shop, and offered custom slots for things other than the in stock items. And that’s about where I’m at now. My biggest challenge at the moment is marketing and advertising my creative products. I’m happy doing the creative stuff, but I have very little idea about the business side of things. I know it’s pretty easy these days to set up an online shop with little prior knowledge, but running that shop successfully isn’t as easy as you might think. Pricing is an interesting issue that I’ve had to tackle recently: I’ve read that it’s essential to hit a sweet spot — too cheap and people will wonder about your materials and doubt the ‘handmade’ nature of your stuff, and too expensive and they won’t think it’s worth buying. I’m also discovering that it’s all well and good getting likes on Facebook, followers on Twitter, and comments saying how lovely my sewn goodies are and how great my ideas are, but turning those into sales takes some work. I’m still learning how best to do this, so I don’t have a huge list of tips; in fact if anyone has any advice to offer me on this matter I’d be very keen to hear it. The most important thing I need to remember in this challenge is that I’m doing this because I enjoy sewing a lot. I find it hugely satisfying to complete a project, especially something that is very practical and looks good at the same time. It’s also a good feeling to use fabrics that would otherwise be thrown away or into the recycling bank, and make new items from old, giving them a new lease of life. I might find the business side of my tasks more boring than the creative ones, but I know I need to work at these too if I want it to succeed. At the end of the day, though, I doubt being a WAHM will make us millions, but just to cover the cost of my materials and earn a bit of pocket money doing something I love would be brilliant. That’s the plan. Just recently I’ve been finding a real enthusiasm for sewing. I used to do quite a bit as a teenager, both in school as part of textiles GCSE and out of school, making a few clothes and bags for myself. 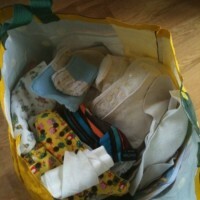 It’s my love of cloth nappies that’s really got me into it again. When I figured out that I could make my own washable wipes and good quality wet bags cheaper than I could buy from retailers or work at home mums (WAHMs) (that reminds me, I still have one large wet bag spare if anyone would like to buy it 😉 ), I was happy with my end products and enjoyed making them so much that I then decided to make some more nappy-related items – in fact nappies themselves. I started with some fleece soakers, i.e. 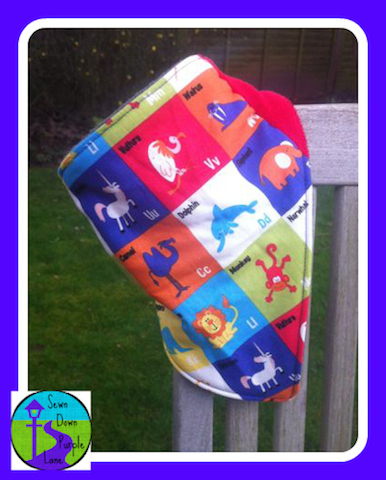 waterproof nappy covers, instead of a PUL (laminated fabric) wrap with velcro/poppers. 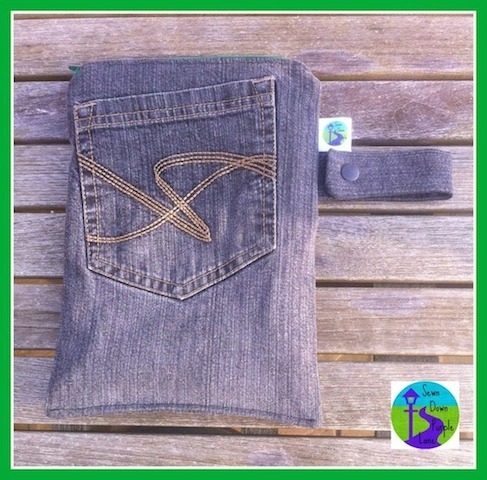 We’d started using them when I bought some reduced in Real Nappy Week back in April, and they work really well over night for the boys, but we needed some more as Andrew had already outgrown the XL ones that I’d bought (so they got passed on toe Joel). For the first one I made, I used an old fleece dressing gown that neither of them had worn much because our flat has a pretty consistent temperature all year round with efficient heating. For the next ones I made, I used some fleece jumpers that my parents were going to take to a charity shop when they sorted out their wardrobe. 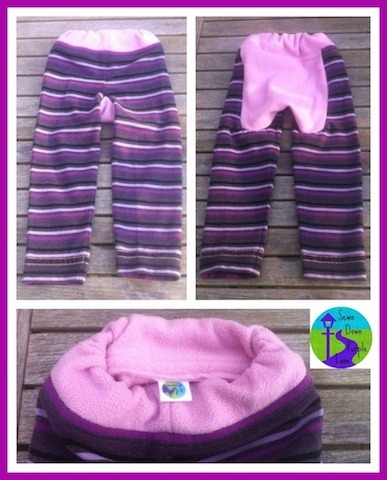 I’ve also bought some new fleece which was reduced online, and will be using that soon (see the zebra print nappy below, plus another frog print fleece). My next creation was what I call a ‘nap’ nappy for Andrew – he uses the potty/toilet when awake, and often doesn’t wee at all during naps, but he still has the odd day with a wet patch so I’m keeping nappies on him for a bit longer when napping. 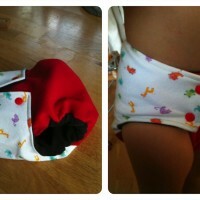 It is an all-in-two design, similar to our itti bitti nappies that are a little tight on him and they don’t make an XL. I came up with my own pattern for this nappy, based on one I found on the internet and adapted to give it a higher rise and a slimmer crotch. The fabrics are again up cycled old clothes – a couple of colours of fleece jumper and a cotton jersey babrygro. The shell of the nappy of course needs to be waterproof, so I bought some new plain white PUL (the waterproof but breathable fabric used in nappies and wraps) for this. Then I decided to concentrate on night nappies for Andrew, because we have to boost some of his so much that he really looks like a weeble and the fleece covers are hard to get on. I don’t mind night nappies being a bit bulky, as they’re in bed and it doesn’t bother them, but some of Andrew’s are a little ridiculous. I think being dry in the day means he still wets quite a lot at night, but hopefully not for too much longer. I wanted to try some ‘Zorb’ fabric, which is a blend of various fibres, natural and man-made, and is supposed to be very absorbent relative to its thickness. I found a small piece going cheap on a pre-loved site, so bought that as a trial. My first creation with it is a Zorb-lined pocket with PUL and fleece outer, for maximum waterproofing! I didn’t really know how it would turn out, but in the end i’m very pleased with it. We stuff the pocket with a couple of hemp boosters, and this easily lasts him the night and is much slimmer than his biggest bamboo night nappies. The Zorb catches the wetness first and spreads it away from the wet zone quickly (because that’s what Zorb does), and then the very thirsty hemp picks up all the wetness that goes through the Zorb, and the PUL and fleece outer of the pocket stops that wetness escaping. So far we’ve had no leaks, and the extra high rise and extra layer of Zorb that I sewed into the front of the nappy is great for a boy tummy sleeper. The next nappy I wanted to have a go at was a ‘hybrid fitted’. 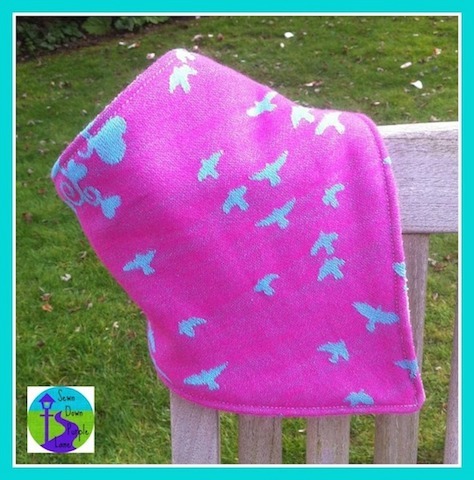 The idea of these (such as the ‘A Mama Knows’ brand which we have one of) is that it has a hidden layer of fleece in the core, which repels water back into the absorbent bit of the nappy, meaning that for light wetters in the day you don’t need a separate waterproof wrap and for heavy wetters and at night you still need a cover but you have an extra layer of water resistance to help stop leaks. Whoever knew that nappies could be so scientific?! The researcher in me loves reading about all this kind of stuff! So I made one of these using my pattern from the other nappies that I made, which has seen a few minor alterations with each new nappy, to try and optimise the design. 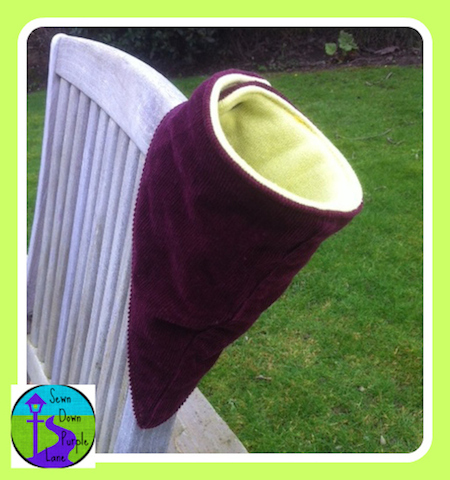 The inner absorbent bit is cotton terry, with 2 layers of Zorb and one layer of fleece inside, then a burgundy corduroy outer with an appliqué monkey on – the cord was from an old pair of trousers and the monkey from a badly stained t-shirt. This works well too. Andrew has worn it over night and again it’s less bulky than some of his other night nappies, and I could probably use this for his nap without a cover though I haven’t had chance to try this yet. My next nappy project is going to be a wrap, made with some lovely bicycle-print PUL that I got in the sale at one of the online fabric retailers. I haven’t used ‘fold over elastic’ before, which is the stuff that I need to sew around the outside as a binding to the raw fabric edges, so we’ll see how that goes. I need to have a day when I have plenty of time to experiment, so probably a weekend. And finally, I’ve even been inspired to branch out into clothing for the boys. Andrew has recently grown out of his 2-3 years trousers, and his 3-4 years ones are a little big around the waist but he needs the length. 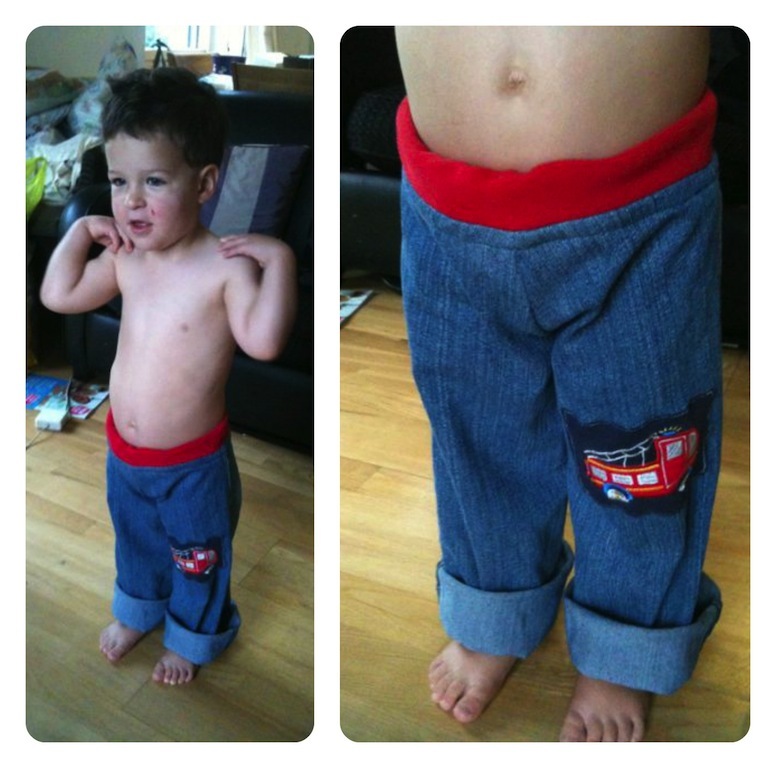 As I have quite a few pairs of old trousers of mine that are worn through in some part or are just too small since having kids, I thought it would be great to use a pair to make him some trousers. 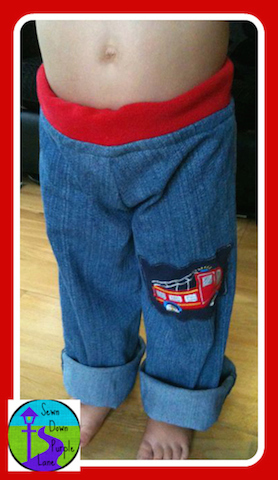 I chose some jeans, plus an old red fleece to make the waistband, as well as a fire engine embroidery to appliqué on, which was on a baby vest that was stained elsewhere. This was very simple to do, and Andrew is very impressed with his new trousers! I made the length with plenty of growing room, but the waist and hips fit him well so they shouldn’t fall down! I hope you’ve enjoyed looking at and reading about my projects. So far the feedback I’ve had on them has been very positive, which is lovely to hear. A bit like writing the blog, I sew because I enjoy it, but it’s also nice to know that other people are benefitting from the end result – blog post / wet bag / nappy / trousers. 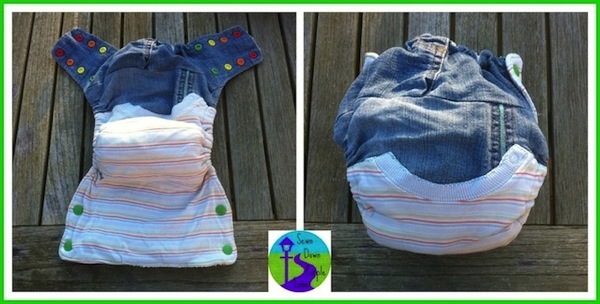 This is a fitted nappy made from bamboo terry. 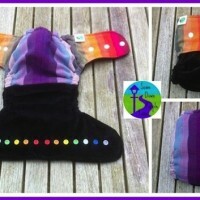 It comes with a bamboo booster (sewn in for sizes 2 and 3, separate for size 1) and a fluffy fleece liner. 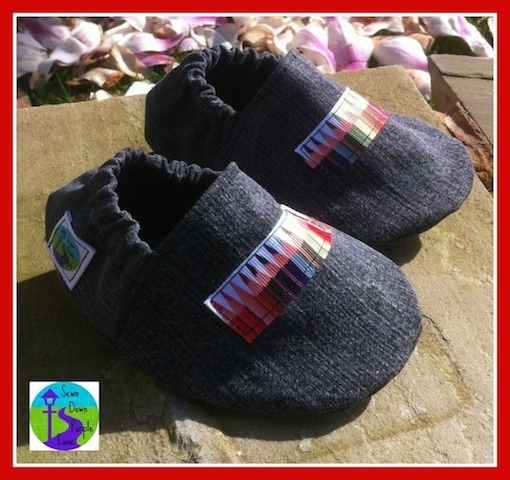 It requires a separate waterproof wrap – Little Lamb make these too, or you could use another make, or a wool or fleece soaker at night. Around £9 for a single nappy. 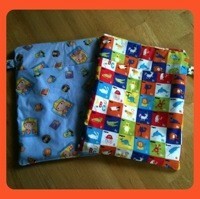 But also available as large kits (10 or 20) which work out at less per nappy, and often on offer in multiples (e.g. 5 for £25) at various retailer websites. I think that these are good value for money at their normal price, and excellent value for money if you get a good offer. They are long lasting and you can often get some money back by selling them pre-loved in good condition. Excellent! Bamboo is thirsty and there are several layers of it in the nappy and booster. These make good nappies for heavy wetters in the daytime, and good night nappies for average wetters or heavy wetters if boosted with extra bamboo or hemp boosters. Excellent! As they are a fitted nappy which requires a wrap or soaker cover, there are two barriers for containing poo, so it is unlikely that it will escape. The elastic around the leg holes is very stretchy, which means that it fits both slim thighs and chubbier thighs, and I have also easily mended one of these nappies in which the elastic had deteriorated with lots of use but the main fabric of the nappy was fine. We haven’t had a leak with either child wearing these nappies. Bulky and fairly low rise. These are not trim as far as nappies go, but considering their absorbency, I think their bulk is not bad for a fitted nappy. When boosted for overnight use they are pretty huge, but I don’t mind big nappies at night if they hold my toddlers’ heavy wetting. 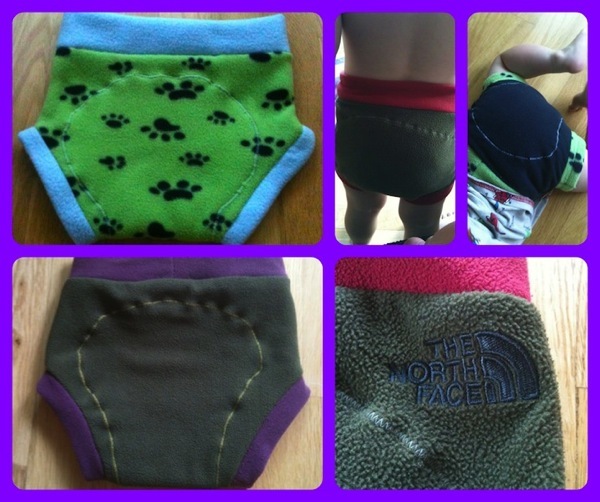 They are also quite short with a low rise, so I have found that a size 3 is essential on my tall toddler, even though many children would probably get away with just sizes 1 and 2 before potty training (unless you’re using them at night as it may take longer for them to be dry at night). Slow. On a nice sunny and breezy day these are dry in a day outside, but inside on an airer they can take unto 2 days to dry. They are usually the last to dry out of all the nappies in our personal stash. It is possible to tumble dry them, but this can negate the environmental benefit of using cloth nappies over disposables and shortens the life of the nappy if done regularly. Average. As it’s a fitted nappy that needs a separate wrap, change time is always going to be longer than a one-part nappy, but for a fitted, I think these are pretty fast because they have aplix fastening. Average. 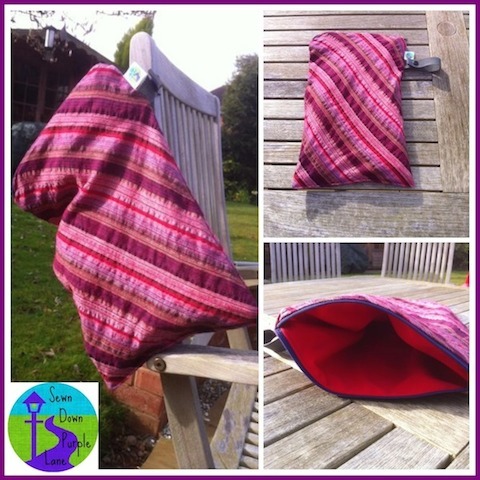 As it’s a two-parter so needs a wrap, you may need to explain that to anyone else doing the nappy change and it’s not necessarily as easy as a one-parter, but for a two-parter I think these are easy to use. As it goes under a wrap, it’s not surprising that there is no colour or print on the nappy itself. I love how soft the fabric is next to the skin – the bamboo is silky smooth (though I noticed the difference between ours washed in Cambridge hard water and a few that were donated to the library by a friend living in a soft water area), and the fluffy fleece liner that comes with it is gorgeously soft compared to other fleece liners we have. I would recommend this as a durable, good value for money nappy that is perfect for heavy wetters in the daytime and any wetters at night (boosted for heavy wetters). It is also good for containment on newborns with a good wrap. It is an essential in my stash, along with other quicker drying nappies. Disclaimer: I have received no incentive for writing this, and all views expressed are entirely my own and honest, based on our experience of using the nappies. Just recently I’ve rediscovered just how much I love sewing. I did quite a lot as a teenager, but since having kids I haven’t had the sewing machine out much. 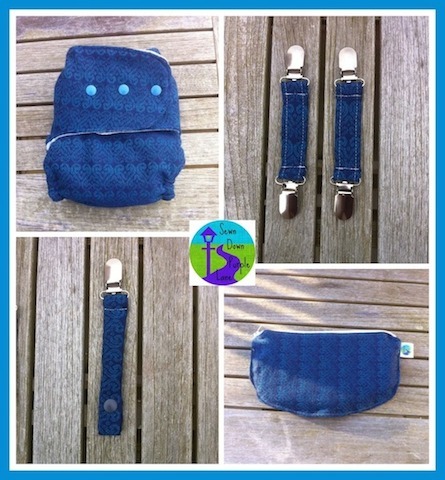 There were a couple of nappy-related items that I thought would be very practical to have, and these became fun sewing projects to get my teeth into it again. I realised when Andrew started wanting to wear pants when out and about that I really needed to invest in a good wet bag because we have quite a few accidents still, and I have two children with wet nappies/pants/trousers to take home when we go out. I also wanted one with a ‘dry’ area, as I always had loose spare clothes in my change bag and thought it would be easier to keep them in a bag together. But when I looked online, all the wet/dry bags that looked good quality were a bit too expensive, so I decided to buy some fabric myself and make two wet/dry bags. The outside is cotton, in Bob the Builder and Animal Alphabet prints, and the lining is a thick and durable sandwich PUL (the laminate layer is sandwiched between two polyester layers – makes it very easy to sew with and is extra thick for wetness protection) in bright orange (Bob) or blue (animals). The front pocket is for dry clothes/nappies, and there is a poppered handle that can attach to a buggy (for example) which is triple stitched for durability. 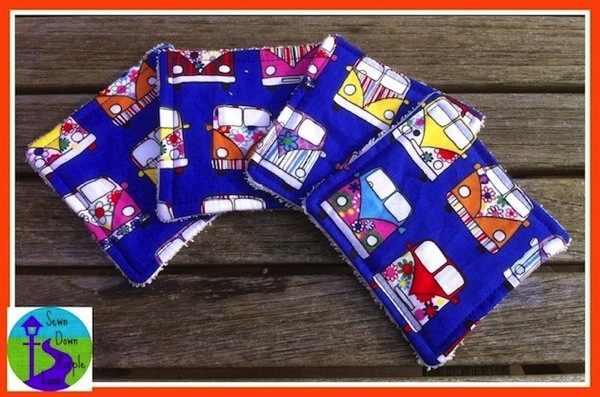 I bought enough fabric for four bags, and I have swapped one with a friend for a night nappy that I wanted to try and a daytime wrap for the Nappyness library, and I sold one on a cloth nappy forum. As far as I know, both recipients like them. During Real Nappy Week, I bought a couple of fleece soakers for Andrew because I’d read that they were good at night and I was also buying some bigger night nappies for him at the same time as he’d grown out of some of his others. The soakers worked brilliantly, and having seen one in real life as opposed to a picture on a website, I realised that my sewing skills were up to making them. So I set about making some more, using fleece from old clothes and blankets, so they are completely upcycled. In fact for one of them, I accidentally cut the fabric to include the ‘The North Face’ logo on the jumper I was cutting up, but then I decided that it actually looked rather cool with the logo, to show that it was an upcycled item of clothing. The next one I made, I deliberately cut the leg cuff fabric to include the ‘Regatta’ logo. Andrew is now getting a bit big for the XL ones I bought, so I’ve made a few more XXL and Joel is just about fitting into the XL (he has a well boosted night nappy and needs it for the rise height, though it’s looser around the thighs and waist on him than on Andrew). I’m also making one of each size for the Nappyness library, and the medium and large are already available for loan – I originally made the medium thinking it would be for Joel but forgot that it needed to fit over a night nappy rather than day nappy (baby brain moment!) The patterns that I’m using are those I found on Katrina’s Sew Quick Soaker Pattern blog. I’ve also sewn some more washable wipes (as I explained in this previous post) from upcycled nappies and clothes, and these are also available to borrow from the library. As I’ve been sewing, I’ve been dreaming about having a better place to do this other than our kitchen table in quite a small flat. I have a little picture in my head of a cafe with a toy corner (like Livng Stones, the one we go to for meet-ups) which is also a shop that sells cloth nappies (new and preloved) and accessories, and there is also space for me to sew wet bags, soakers, wipes etc. All the mums I meet up with in Living Stones agree that there should be more cafes like that in Cambridge, and I think the city is the kind of place that parents would welcome a shop where you can actually buy cloth nappies having seen them for real, not just online. Of course they could try them from the library first too. On Wednesday we had another Nappyness meet-up, this time in town at Livingstones Cafe with the lovely toy corner which keeps toddlers amused for hours! It was a busy morning in the cafe with another big group of mums with babies, probably an NCT group as is often the case there. Our group was smaller, but just the right number to have a good chat about nappies and discuss a few things. One question that came up as we get into holiday season was whether we use disposables or cloth nappies when on holiday. My answer was disposables, because we rarely go away, maybe for about 3 weeks a year in total with a week in the summer, a week at Christmas and weekends here and there added up, so I’ve not felt too bad about using disposables for that length of time given that we use cloth day and night the rest of the year. We always go somewhere with a washing machine, usually our parents’ houses (handy that we have one in Devon and one in the Lake District), but even so I like to have a break from doing washing for a short time. Other mums there have experience of using hybrid nappies when on holiday. These are nappies for which you can buy both cloth and disposable inserts, such as Bumgenius Flip or Charlie Banana pockets. So on holiday you can use the disposable inserts, which are similar to the ‘eco’ disposable nappies which biodegrade quicker than normal disposable nappies, and at home you can use the cloth inserts. This is a good tip if you’re thinking of using cloth nappies when away. Another tip that came up was what to do with old nappies that have gone very coarse, if you don’t have a tumble dryer to fluff them up – instead you can use a hair dryer to gently blow warm air around the nappy when wet (placing it on a wire cooling rack that you use for baking will help to circulate air around the nappy). I’d not heard this tip myself before, although I do use a hair dryer (as I don’t have a tumble dryer) to seal the seams of the PUL in the wet bags that I make, and it’s the same principle of blowing warm air. 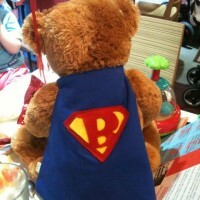 Whilst all of this chat was happening, our special guest Buster Bear was happily sitting on our table in his Bambooty cloth nappy. 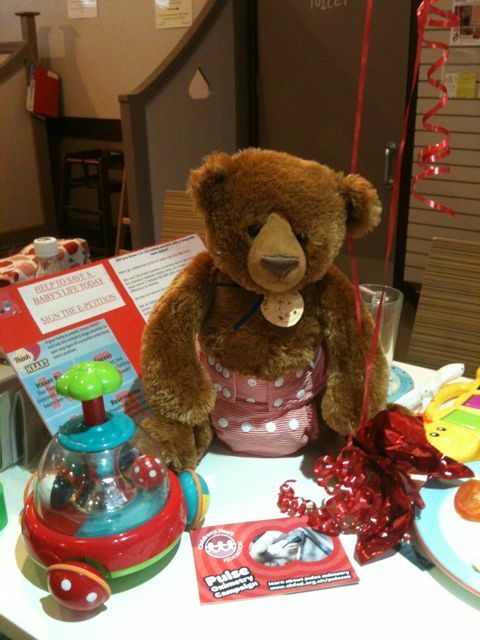 Buster is travelling the length and breadth of the country, going to events such as nappy meet-ups, baby/toddler groups, even a Girl Guide group recently, raising awareness of the Children’s Heart Federation’s “Pulse Oximetry” and “Think Heart” campaign, raising money for HeartLine and spreading fluffy cloth nappy love. He brought his petition with him, which, with 10,000 signatures, he’s hoping will persuade the Government to roll out Pulse Oximetry screening for all newborn babies in the UK. The test is simple, quick, painless and cheap, taking just a few minutes alongside other existing newborn checks. Research shows that the test will significantly improve the detection of congenital heart conditions in babies, which are the most common birth defect, picking up three quarters of heart conditions, preventing further physical damage to children and helping save lives. Buster has certainly raised my awareness of this as I had no idea about it! 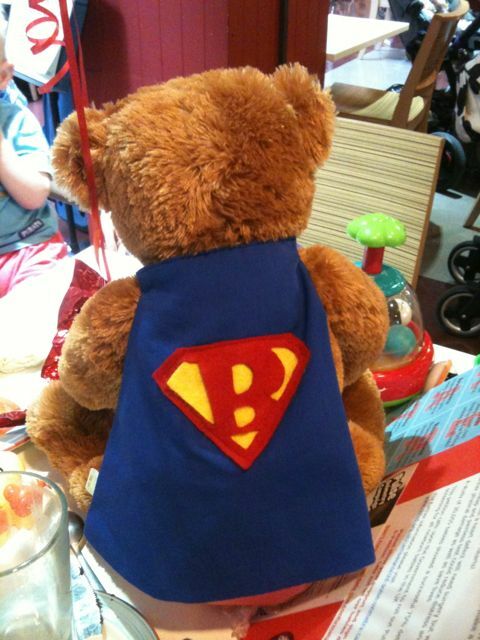 I hope that he raised awareness amongst the other mums in our group too, and with his big red balloons in the cafe, it is quite possible that the other group of mums there couldn’t help but notice him and his cloth nappy. His lovely suitcase that he’s travelling around in also caught a few people’s attention. So there we go, another meet-up to spread Nappyness is Cambridge. The next one will be in 2 weeks time, and I’m currently deciding which day is best. Please let me know if you have a particular preference for time, day and place and I’ll try to go with the majority. Next week I’ll be at the NCT Cambridge Bumps and Babies group with the library, Friday 19th July, 10.30-12.30, Unitarian Church Hall, Emmanuel Road, Cambridge. Hope to see you soon! For this meet-up I decided that a day, time and venue different from the first meet-up would be good, so that hopefully it would suit some people who couldn’t make the last one. Monday 10th June 11am-1pm at Living Stones Cafe in central Cambridge was what I went for. There is a play area for older babies and toddlers which Andrew loves, so we often go there when in town and in need of a refreshment stop. I knew a few people had said they were planning on coming, though unfortunately one family couldn’t make it on the day as the toddler was poorly, so I was looking forward to seeing them and any others who might turn up. When we arrived, Andrew soon settled himself in to the play area, and I ordered some drinks. We were soon joined by two mums, one with a toddler and one with a baby, and it was especially nice to meet one of them for the first time – she’d seen Nappyness ‘like’ something on another Facebook page, so clicked on our page and was pleasantly surprised to see that it was based in Cambridge where she lives! Social networking at its best 🙂 A little later, another mum turned up with her baby, so there were four of us in total. We got talking about our various different nappies. One type of nappy that I don’t personally have any experience of using (yet) is the hybrid system, a compromise between the convenience of an all-in-one and the faster drying time of a two-part system, and some of which include a disposable insert option that many parents use on holiday or when cloth nappies are less practical for whatever reason. One mum had brought her Close Parent Pop-ins along, and another had brought her Bumgenius Flips as well as some Mothercare smart nappies, all of which are this kind of nappy (gNappies are also another popular make). They comprise a waterproof outer and a pre-fold-like absorbent insert (in various fabrics or disposable) which fits into the wrap which is designed specifically to hold it in place. The other three mums are finding that this type of system was working well for them, as well as other types of nappy. One of the mums is also quite a fan of pockets, which I have more experience of than hybrids, though I don’t tend to use them as much as our two-parters and all-in-twos. Three of us are also keen on Little Lamb fitteds, which I use at night time for Andrew as they come in a size three which fits him well unlike many birth-to-potty nappies that he’s outgrown at less than 2 and a half, and we all find that the fitted style is good for times of heavier wetting when pockets, hybrids and all-in-ones just don’t last long enough. We discussed a few other things such as vest extenders and whether we use flushable or fleece liners. We also talked about how the idea of Nappyness was a good one and that there must be more people who would like to come to the meet-ups, including those who are just thinking about cloth nappies or just starting out with them. The other mums were happy to take some posters and flyers to put up at places they go like groups, libraries and children’s centres. So we’re hoping to spread the word through these. I also have a list of places I go to, and other places to make a special visit to, where I can leave a poster and some flyers. I have also been in touch with the ladies who organise our local NCT bumps and babies group, and they are happy for me to go once a month with the nappies to show anyone there who would like a look. On Thursday 30th May, a rather drizzly and damp morning for the time of year, my boys and I headed off in the car to Milton Country Park with a rather large bag of cloth nappies and leaflets in the boot. I was looking forward to meeting up with others who use or want to use cloth nappies, hoping that I could offer some tips, share some experience and also learn something myself. There was a little part of me that was slightly worried that nobody would turn up, but if not I knew we’d have fun there anyway, even if not with nappies! We got there for 10am and I put the Nappyness sign out so people could spot us, though it wasn’t very busy. It wasn’t long before 2 mums and their babies and toddler turned up. Hooray, we weren’t alone! They were more new to using cloth nappies than we were, and we talked about what they had used so far and what they liked about them. Both had borrowed nappies from the Ely Cloth Nappy Library, which is further than Cambridge is for one of them, and we all agreed that we thought it was odd that Cambridge didn’t have anything like Nappyness or a cloth nappy library, given how many young families like us there are here. It’s good to know that I’m not alone in thinking this. I showed them some of my nappies, though my bag was a bit of a jumble and I couldn’t find everything I wanted very easily – note to self to organise it better into smaller bags of different types. And there wasn’t loads of space on our table for putting them all out, which is something I need to bear in mind for next time. It would have helped if the weather had been nicer and we could have sat outside on the grass and the toddlers could have run around more, but never mind, we live in the UK and there’s nothing I can do about the weather! My next move is to get in touch with the local Children’s Centres to see if they could offer us a room. But I think the mums got an idea of the different types that I had and how they were similar to or different from the ones that they had tried from the library. A bit later another mum turned up with her three boys (it was half term so two of them didn’t have school) and brought some of her nappies to show around. This was helpful because she had some that were different from mine as well as some similar ones. But it wasn’t long before the toddlers and older kids were getting fed up of being inside and bored of the toys I’d taken, so we had to disband a little before 12 noon and head out into the wet park. There was a fundraising event for the Stroke Association going on, and one of their activities was a bouncy castle, so I let Andrew have a go to jump off some of his energy. 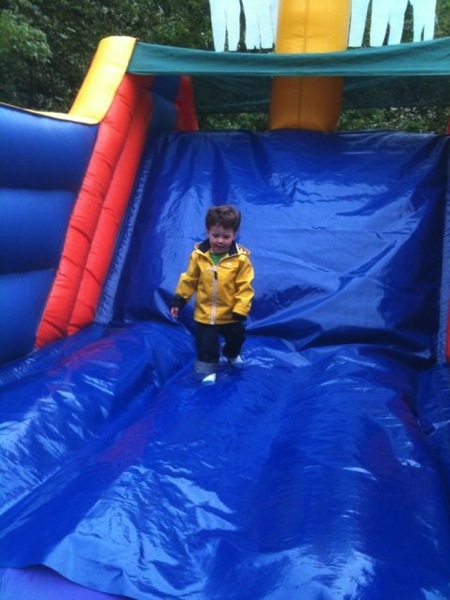 Andrew’s chance to let off some steam after being couped up in a cafe – a wet bouncy castle! All in all it was a great start to the meet-ups. I’m glad it wasn’t just us and that people seemed to enjoy it. I’m still working on building up the library to have at future meet-ups, and have very kindly been donated some more nappies recently so we are making good progress. I’ll keep you updated. I’ve set the date for the next meet-up on Monday 10th June, 10.30am-12.30pm at Living Stones Cafe, St Andrew’s St, Cambridge. I thought I’d try a different day, location and time to see if that suits others better. I’m experimenting with these to see what works best for everyone. Author RuthPosted on 30/05/2013 31/05/2013 Categories nappynessTags cloth diapers, cloth nappies, cloth nappy library, nappies, reusable diapers, reusable nappies, washable diapers, washable nappiesLeave a comment on Nappyness meet-ups are launched!